Bestplate, the UK’s leading manufacturer and supplier of acrylic number plates and number plate printing systems announced today it has officially launched a new website. 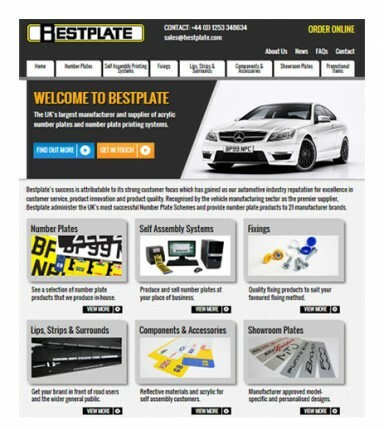 The new website, which offers quick and easy access to information on Bestplate and its products, is part of the company’s ongoing efforts to enhance the quality and availability of product information and aftersales support to its motor trade customers. Created with their customers’ user experience firmly in mind, the website has been designed using the latest technology so its compatible with the most current internet browsers and without the need for Adobe® Flash or the requirement to download plug-ins to view its contents. The website boasts a modern design, easy-to-navigate functionality, and provides more product information relating to Bestplate number plate systems, number plate components and its wider range of in-car promotional items and automotive apparel. Customers can quickly enquire upon any product featured by clicking on a neighbouring link which generates a contact form in which the relevant product description is pre-completed in the ‘subject’ line. Customers wishing to purchase number plate components can order 24/7/365 through an Online Ordering System which is accessible from the ‘Order Online’ link present on all webpages. The website introduces an FAQ section with embedded YouTube ‘how to’ videos that respond to common customer questions on the maintenance of number plate printing equipment. This new feature will not in any way replace Bestplate’s on-site and phone based technical support, but instead provides customers with an alternative method of receiving technical assistance. Visitors accessing the news section can stay informed with company news and legislative developments concerning number plate manufacture and supply. As part of the Zell-Em Group, visitors can also link to the Group’s social media pages where they can remain in-touch with number plate developments as well as product updates and special offers on motor trade promotional items and clothing. Zell-Em Group’s growth as a leading automotive supplier is attributable to maintaining face-to-face relationships with its diverse range of motor trade dealers and suppliers. Deployed through national field-based teams, this customer-centric and personal approach has remained part of the Group’s strategy since its inception 68 years ago. Whilst Bestplate continues to pursue this strategy, it also recognises the importance of constantly innovating and evolving its online sales and support channels. To this end, Bestplate are proud of the new website – and hope it provides a useful, informative portal for its customers.